Please enjoy this teaser for my upcoming novel, RECIPROCAL EVIL. “It is magnificent, is it not?” The handsome bearded man held the younger girl’s arm as if supporting her, and guided her into the nave of the old church. She didn’t look around, nor did she answer. She wore a long cloak that looked too warm for the day’s temperature. Again, no answer came. The girl stumbled as he released his grip on her. He placed his arm around her waist again, holding her up. The church was empty, as he knew it would be. His lords and masters would make certain that no one would be present to interfere with the ceremony. “It is a long walk to the altar. I wish I had thought to bring along a wheelchair to help you, my dear. As it is, however, you’ll have to walk. Never fear. I will help you.” He looked at his young companion. She looked lovely, even clad in the cloak. Her reddish-blond hair was full and long, and her greenish eyes were deep pools of beauty, even if they were unfocused due to the drugs he had administered. Too unfocused? Perhaps I gave her a bit too much of the compliance drug? No matter. She had already agreed to her participation in the ceremony. The hour was almost upon them, and he had only a few more preparations to make, mostly involving her placement on the altar. “You always wanted to walk down the aisle, my dear. Even though we say we are married, you have never made this walk. I wish you were more…aware. You might savor the moment.” He chuckled again, and they made their way to the front of the church, where he helped her up the steps and guided her to the front of the altar. He reached to her neck where the cloak was buttoned, and he unhooked the clasp. The dark garment fell to the ground, revealing a short white diaphanous gown. “Perfect!” he smiled as he stepped back, taking her beauty in. “Lovely!” The gown hugged her figure in all of the right places, billowing around her hips and thighs. The girl followed his instructions, stretching out on her back and placing her arms at her sides. The man smoothed her gown around her body and lifted her arms onto her stomach, crossing them there. He opened the bag which hung from his shoulder and withdrew two lengths of soft black rope. He used the first to bind her wrists and the second to tie her ankles. He nodded as if she had, removed a large black leather-bound book from the bag and placed it at her hip. Opening it, he extended his arms over her and chanted words that sounded much like a prayer. Just like the masses that are usually said in this place, he thought as he finished the first part of the ritual. He knew that if anyone was to come in and see him, they would assume he was a priest performing a service in private. He waited, and so did his lovely faux-bride. When he sensed that the time was right, he injected her with a counter-agent to reverse the effects of the drug he had administered earlier in her drink. She had not been aware that he had drugged her; she had simply become more and more compliant until the drug hit its full potential. But none of that mattered now. What mattered was that she was conscious and aware as he finished the ceremony. He watched as her eyes focused, looked at him and then at her surroundings and realized her predicament. “What…?” she began, but he shushed her. He placed a hand on her forehead, holding her down against the altar as he intoned the words he had memorized so well. As he finished, he looked down at her and saw the fear in her eyes. He smiled. If that sounds interesting, sign up for the mailing list to know when RECIPROCAL EVIL is released at special limited time pricing. Or just watch this page or like my page on Facebook, where information will also be posted. This entry was posted in Uncategorized on November 7, 2018 by Scott Dyson. 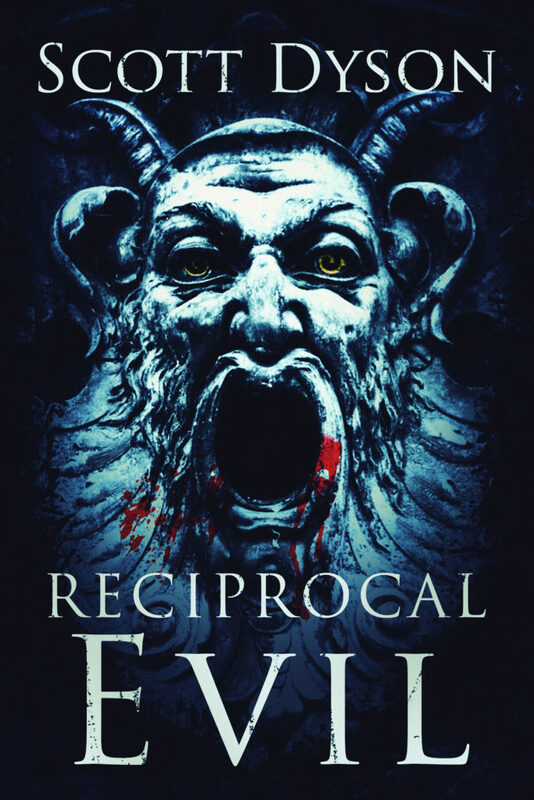 My novel, RECIPROCAL EVIL, will be released either Friday, November 9th, or Monday, November 12th. I’m excited; it’s the first new release I’ve had in a couple of years. It’s my longest work to date, clocking in at over 50K words. What’s it about, you ask? Doesn’t that sound good? I hope so! 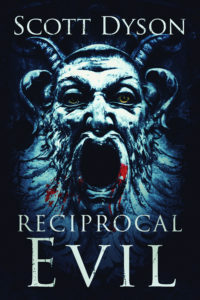 Watch for special release pricing of RECIPROCAL EVIL! Coming very soon! This entry was posted in Uncategorized on November 5, 2018 by Scott Dyson. I’m giving away another one! Starting tomorrow, October 30, my short story collection DIE 6 will be free for two days and two days only! These are three older and three newer stories, and I’m proud of them They range in length from about 2500 words to almost 11,000 words. They’re not all horror – two are more science fiction and two straddle the lines between genres, I think – but they’re all pretty fun. Grab them tomorrow! DIE 6, free from Tuesday October 30 to Wednesday October 31! This entry was posted in Uncategorized on October 29, 2018 by Scott Dyson. The Cave free promotion is over! Upcoming books include RECIPROCAL EVIL, a short novel featuring a supernatural serial killer, ODD MAN OUT, a novella-length expansion of the short story, and THE NEVER ENDING NIGHT, also a novella about evil in the neighborhood. FYI, THE CAVE costs $1.49 if you buy it, so it isn’t like getting it for free will save you a fortune. And I’m still including it as a giveaway for signing up for my mailing list, if you missed the free promotion! Take care and thank you all! This entry was posted in Uncategorized on October 22, 2018 by Scott Dyson.